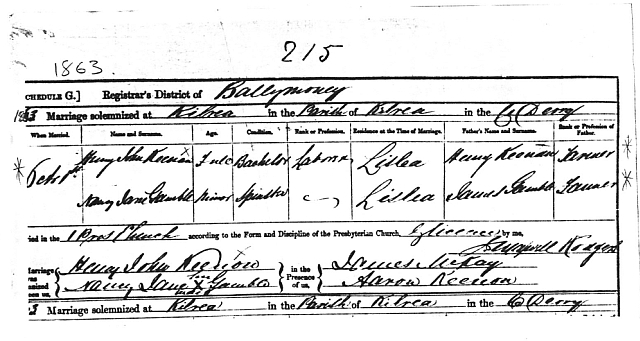 Married: Nancy ("Ann") Jane Gamble of Lislea, County Derry, Northern Ireland, on 1 October 1863. They were married at the 1st Presbyterian Church, Kilrea, County Derry, Northern Ireland. 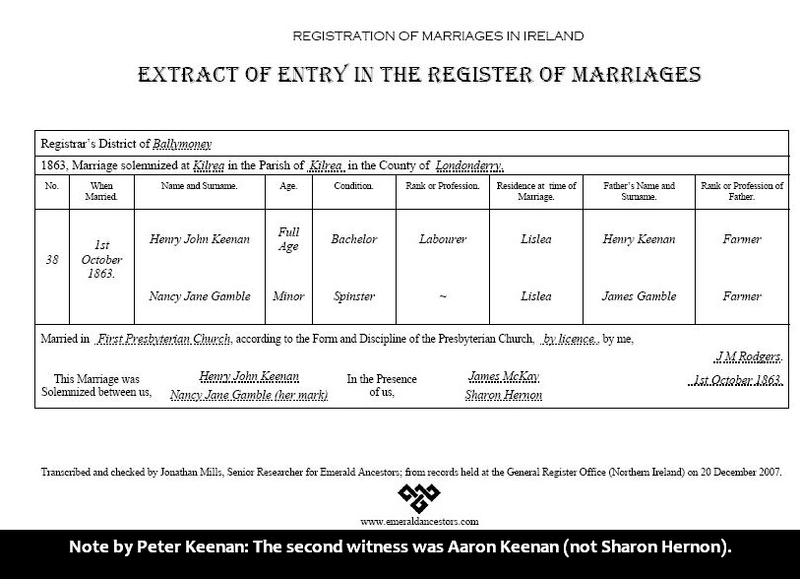 The marriage certificate (see below) (film number 101443) shows that Henry John's father was Henry Keenan; the witnesses were James McKay and Aaron Keenan; Nancy Jane Gamble's father was James Gamble. Hospitalisation: Henry was admitted to the Gladesville Mental Hospital on 22 September 1885 at 43 years of age and suffering from dementia. He remained there until his death, 3 years and 9 months later. The true nature of Henry's illness may not have been mentioned in the family. For example, Hazel Colliss, daughter of Ivy Morris (nee Keenan), told me in 2002 that her mother told her that Henry had "died at an early age from over-work". Click here for more information about the Gladesville Mental Hospital. Deceased: 22 June 1889 at Gladesville, New South Wales, Australia. Causes of death: See Hospitalisation note above and the link. Henry died without making a will; administration of his estate was granted to his widow, Ann Jane Keenan, in April 1891. Buried: Gladesville, NSW. The "Burial Register" exhibited below shows that Henry was burried in the Protestant section of the Gladesville Hospital Cemetery, grave number 1089. However, my research shows that these graves can no longer be located. Children: See the page on Batlow Pioneers or page on Nancy Jane Keenan (nee Gamble) 1844. Photographs: As Henry John Keenan died just before cameras became available to amateur photographers, there are unlikely to be any photographs of Henry in existence. However, there are photos of his brother, Stewart Keenan of Western Australia, and these give a clue to what Henry looked like. (See my page "The Keenans of Western Australia" for photos of Stewart.) Also, on seeing a photo of George Aaron Robert Keenan of Batlow in about 1913, a person who was a neighbour and friend of Henry John wrote that George looked like Henry. (See my page on Ivy Morris nee Keenan). Photos of George Keenan appear on his page. "He is a wretched looking illnourished man, 5 feet 4 inches in height with a face indicative of considerable recutal faiu (?). He has a red beard, darker hair, blue eyes, a straight nose and a clear complexion. It is extremely difficult to understand what he says oweing to Constant Choreiform movements of the trunk areas and head. He at any rate seems to be considerably demented tho evidently intelligent and anxious to explain anything connected with himself. He needs assistance to walk. He takes his food, is cleanly in his habits and sleeps well." Other notes made by staff at the Gladesville Mental Hospital are reproduced further down this page. THE FOLLOWING INFORMATION ABOUT HENRY JOHN'S ANCESTORS IS SUPPLIED BY MRS ANITA ARNOLD OF ENGADINE, NEW SOUTH WALES. More recently some additional information has been obtained on-line from The Public Record Office of Northern Ireland (PRONI). Father: Henry Keenan, born 1808, died at Glenone on 24 December 1881, Glenone, County Derry, Northern Ireland. Henry had a brother named John. Letters of Administration of Henry's estate were granted on 18 April 1882 to his brother, John. Henry's occupation is shown as "Labourer", and his "Effects" were valued at 112 pounds 4 shillings. Brothers and Sisters: Stewart (b.1836	or 1834), Aaron, Elizabeth, David (b.1846), James (b.1847), John. NOTE BY PETER KEENAN: In the	family tree there is no John. Instead there is a Robert. Grandfather: Anita says that Henry John's grandfather was John Keenan, a Presbyterian, who died 1863. However, my research has found only one John Keenan in County Derry who died in 1863; and he is said to have been 63 at the time, which would mean he was born in 1800. On my calculations Henry John's grandfather would have to have been born in about 1785. Great grandfather: Anita says that Henry John's great-grandfather was Henry Keenan, a Catholic, died 1830, Kilrea, County Armagh, Ireland. However, this information appears to me to be doubtful. There are two towns named Kilrea: one is in County Armagh and the other in County Derry (or Londonderry). My branch of the family resided	near Kilrea in County Derry, not in County Armagh, and were Protestants/Presbyterians. General: During a phone conversation with Anita in April 2002, Anita said that there was/is a pew in the church at Kilrea belonging/to or named Keenan. She also said that the Keenans received a grant of land from William of Orange; and that the cottage was still there (she didn't know where), although that it no longer belonged to the Keenans. I have since heard of this tale of land being granted to the Keenans by William of Orange, as a reward for fighting on William's side in a war (at or after the Battle of the Boyne, 1690? ); however, I've never seen any written mention of such alleged land grant. For family history see 1949Newspaper Article. This copy extract was emailed to me by Bevan Stone on 16/11/2012. It shows that Henry John Keenan,	died on 22 June 1889 at the age of 47 and was buried in the Prostestant section of the graveyard at the Gladesville (NSW) hospital, grave number 1089. This grave and nearly all the others at the hospital can no longer be located. The reference number (5832) is the number assigned to Henry John Keenan in the hospital's Register of Patients and Admission Book; the Date of Admission to the hospital is 22/9/1885. 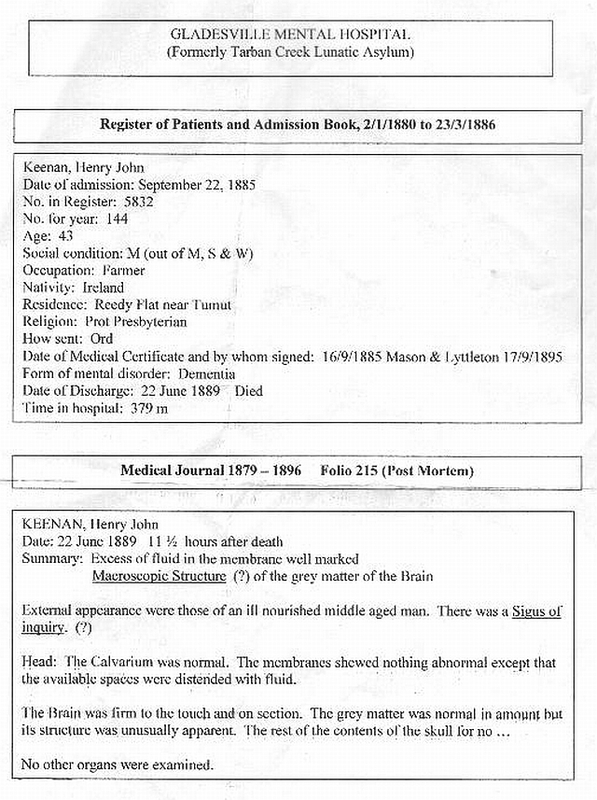 For more on Henry's time in this facility	see the	extract from hospital records that I prepared several years ago. Further History : - Medical certificates state that he threatened to injure his wife and burn down the house. Believed that one of his children was pregnant and was incoherent in speech. In the R.H. (a few hours) he was quick and clean. He is a wretched looking illnourished man, 5 feet 4 inches in height with a face indicative of considerable recutal faiu (?). He has a red beard, darker hair, blue eyes, a straight nose and a clear complexion. It is extremely difficult to understand what he says oweing to Constant Choreiform movements of the trunk areas and head. He at any rate seems to be considerably demented tho evidently intelligent and anxious to explain anything connected with himself. He needs assistance to walk. He takes his food, is cleanly in his habits and sleeps well. The Choreiform movements are less constant and not so worked (?) and are absent at night. No change. He has marked delusions of persecution and believes that he is to be divorced from his wife. He has gradually grown thinner altho the choreie movements have been kept in check by Hyosoqamine (Hyoscamine ?) / Mereki Auiorhous/ (?) gr 1/12 in 2 doses. He died at 3.15am. TUMUT POLICE COURT. MONDAY, FEBRUARY 4 (1867). Before the Police Magistrate. Wages — Henry Keenan sued William Murphy for 15s. wages. The defence set up was that Keenan was not hired ; but Piper, who was a witness for Keenan, swore that Mr. Murphy set Keenan to work. Verdict for amount claimed. The NSW Titles Office records show that Henry John Keenan of Upper Gilmore, Miner, purchased 2 acres of land (Vol. CLIXI, or Vol. CLX1, Folio 59) (Portion 26) for £2.0.0 on 23 November 1871. He held the property until 29 August 1878, when it was transferred to Jeremia Regan. After several other transfers it was transferred to the Bowmans (Percy Sidney and Ernest Frederick) on 24 June 1946. The purchase by Henry J Keenan is one of many Crown Land Sales recorded in The Gundagai Times and Tumut, Adelong and Murrumbidgee District Advertiser on 8 December 1871, where it is described as "Lot C, 2 acres, county of Wynyard, Parish of Batlow, adjacent to the south-western corner of portion No.4". 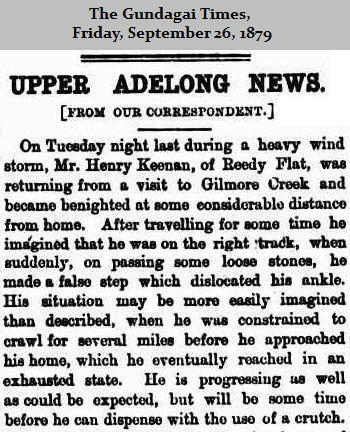 It is also reported in The Goulburn Herald And Chronicle, Sat 2 Dec 1871 - page 6. During the period of Henry's ownership of this land 4 of his children were born: Grace (1871-1915), John (1873-1957), Mary (1876-?) and Henry John (3/8/1878-1889). It appears that in 1882 Henry John Keenan purchased 40 acres of land in Batlow, although I cannot, at this stage, say where it was (though it was probably along what is known as Keenans Road in Batlow). In The Gundagai Times and Tumut, Adelong and Murrumbidgee District Advertiser on 3 February 1882 it is reported that "selections were taken up at the Tumut Land office on Thursday Feb.2 :- .... H. Keenan, 40a, Batlow ...." This is also reported in the Wagga Wagga Advertiser, 7 February 1882, and other publications. After Henry died his widow, Ann Jane Keenan, lodged an affidavit for the purpose of obtaining Letters of Administration of his estate. It is said that Henry died without leaving a will. The affidavit, dated 15 November 1891, put the net value of Henry's estate at £15.0.0, made up of land valued (by Robert Timms JP) at £70.0.0, furniture valued at £5.0.0, less debts of £60.0.0, being £30.0.0 owing at 21 June 1889 to Timms and Eyles, Storekeepers of Batlow, for goods supplied, and £30.0.0 described as "balance due to Government on 40 acres of C.P. land". During the period of Henry's ownership of this land 2 of his children were born: Isabella (1883-84) and Stewart/Stuart (1885-1969).